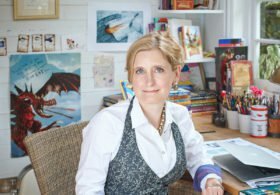 Children's author and illustrator Cressida Cowell has created some fantastic resources for primary school pupils, packed full of writing tips and inspiring illustrations from her books. The resources are part of Cressida Cowell's Free Writing Friday campaign which aims to inspire more children to write for pleasure. The campaign, run in partnership with the National Literacy Trust and Hachette Children's Group, encourages teachers to set aside time every Friday for their pupils to write whatever they want, however they want, in their very own notebooks. Crucially, these notebooks are off limits to teachers and parents, giving children the freedom to write, draw and doodle without worrying about their work being corrected.